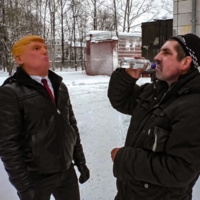 Russian-born American film director Maksim Pozdorovkin (PhD Harvard 2015) will introduce and lead discussion of his 2018 Sundance documentary "Our New President," about Russian domestic propaganda relating to the candidacy and presidency of Donald Trump. "An irrational documentary for irrational times." Charlie Phillips, Guardian.